A team of researchers from several institutions in Germany and Israel has used theoretical analysis to explain the conditions under which mega-ripples form in areas where sand dunes rise. In their paper published in the journal Nature Physics, the group describes combining field measurements with theory to come up with an explanation for mega-ripples. N. M. Vriend and P. A. Jarvis with the University of Cambridge offer a News & Views piece on the work done by the team in the same journal issue. Most people have seen pictures, video or firsthand vistas of deserts with sand dunes. Such deserts, it has been noted, form dunes in just one average size, which are often characterized by ripples. However, the researchers note that there is an exception—sometimes, there are smaller, dune-like bedforms that are larger than ripples. They are called mega-ripples because some believe they are merely a larger version of the ripples that normally occur on dunes. In this new effort, the researchers sought to learn more about mega-ripples through serious study. 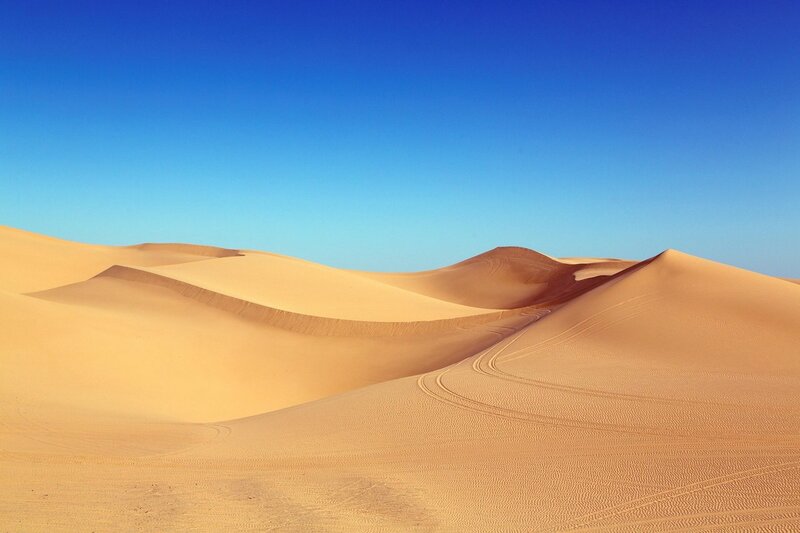 Prior study has shown that dunes and ripples form when wind blows sand around. Sand forms due to erosion. 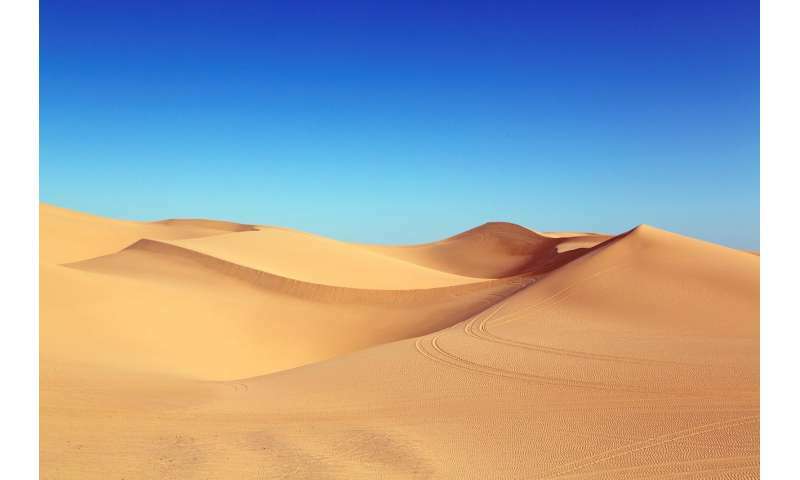 Dunes form when there is instability between the transport of sand, and the topography and the speed at which the wind blows. The variations between these factors is what causes the differences in size between dunes in different deserts. Ripples, on the other hand, are formed by more subtle forces, such as grains of sand that hop around rather than fly in the wind—ripple spacing is defined by hop length. The researchers wanted to know about mega-ripples. What causes them to form, and why are they so rare? To find out, they built a model to replicate what occurs naturally, and then changed factors until mega-ripples formed. The strongest factor influencing the development of mega-ripples, the team found, was grain size under erosive conditions. In areas where there is moderate but constant wind, grain sorting occurs, leaving coarser grains behind due to their weight. Those grains can pile up and develop into mega-ripples. But not for very long, because weather conditions change. For this reason, the researchers have declared mega-ripples to be a type of dune, not a large ripple. Sand is blown across beaches and deserts by turbulent winds. This seemingly chaotic process creates two dominant bedforms: decametre-scale dunes and centimetre-scale ripples, but hardly anything in between. By the very same process, grains are constantly sorted. Smaller grains advance faster, while heavier grains trail behind. Here, we argue that, under erosive conditions, sand sorting and structure formation can conspire to create distinct bedforms in the 'forbidden wavelength gap' between aeolian ripples and dunes. These so-called megaripples are shown to co-evolve with an unusual, predominantly bimodal grain-size distribution. Combining theory and field measurements, we develop a mechanistic understanding of their formation, shape and migration, as well as their cyclic ageing, renewal and sedimentary memory, in terms of the intermittent wind statistics. Our results demonstrate that megaripples exhibit close similarities to dunes and can indeed be mechanistically characterized as a special type of ('reptation') dune.